Definition at line 44 of file llsdmessagebuilder.h. Definition at line 45 of file llsdmessagebuilder.cpp. Definition at line 56 of file llsdmessagebuilder.cpp. All add* methods expect pointers to canonical varname strings. Definition at line 108 of file llsdmessagebuilder.cpp. Definition at line 174 of file llsdmessagebuilder.cpp. Definition at line 139 of file llsdmessagebuilder.cpp. Definition at line 159 of file llsdmessagebuilder.cpp. Definition at line 164 of file llsdmessagebuilder.cpp. Definition at line 169 of file llsdmessagebuilder.cpp. Definition at line 210 of file llsdmessagebuilder.cpp. Definition at line 129 of file llsdmessagebuilder.cpp. Definition at line 144 of file llsdmessagebuilder.cpp. Definition at line 119 of file llsdmessagebuilder.cpp. Definition at line 187 of file llsdmessagebuilder.cpp. Definition at line 179 of file llsdmessagebuilder.cpp. Definition at line 134 of file llsdmessagebuilder.cpp. Definition at line 149 of file llsdmessagebuilder.cpp. Definition at line 154 of file llsdmessagebuilder.cpp. Definition at line 124 of file llsdmessagebuilder.cpp. Definition at line 215 of file llsdmessagebuilder.cpp. Definition at line 195 of file llsdmessagebuilder.cpp. Definition at line 205 of file llsdmessagebuilder.cpp. Definition at line 200 of file llsdmessagebuilder.cpp. Null implementation which returns 0. Definition at line 229 of file llsdmessagebuilder.cpp. Definition at line 72 of file llsdmessagebuilder.cpp. References LLSD::emptyMap(), FALSE, mbSBuilt, mbSClear, mCurrentMessage, mCurrentMessageName, and TRUE. Definition at line 220 of file llsdmessagebuilder.cpp. Definition at line 279 of file llsdmessagebuilder.cpp. References lldebugs, llendl, and mCurrentMessage. Definition at line 234 of file llsdmessagebuilder.cpp. References end, LLMsgData::mMemberBlocks, nextBlock(), NULL, and S32. Definition at line 285 of file llsdmessagebuilder.cpp. Referenced by LLMessageSystem::sendMessage(), and tut::LLSDMessageBuilderTestData::setReader(). Definition at line 309 of file llsdmessagebuilder.cpp. Definition at line 300 of file llsdmessagebuilder.cpp. Definition at line 294 of file llsdmessagebuilder.cpp. Definition at line 297 of file llsdmessagebuilder.cpp. Definition at line 224 of file llsdmessagebuilder.cpp. Definition at line 62 of file llsdmessagebuilder.cpp. References LLSD::emptyMap(), FALSE, mbSBuilt, mbSClear, mCurrentMessage, and mCurrentMessageName. Definition at line 82 of file llsdmessagebuilder.cpp. 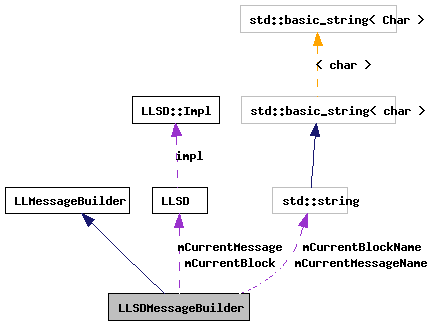 References LLSD::emptyMap(), LLSD::isArray(), LLSD::isUndefined(), llendl, llerrs, mCurrentBlock, mCurrentMessage, and LLSD::size(). Referenced by copyFromMessageData(), and tut::LLSDMessageBuilderTestData::defaultBuilder(). Definition at line 102 of file llsdmessagebuilder.cpp. Definition at line 291 of file llsdmessagebuilder.cpp. Definition at line 127 of file llsdmessagebuilder.h. Referenced by clearMessage(), isBuilt(), newMessage(), and setBuilt(). Definition at line 128 of file llsdmessagebuilder.h. Referenced by clearMessage(), isClear(), and newMessage(). Definition at line 124 of file llsdmessagebuilder.h. Referenced by addString(), and nextBlock(). Definition at line 126 of file llsdmessagebuilder.h. Definition at line 123 of file llsdmessagebuilder.h. Referenced by clearMessage(), copyFromLLSD(), getMessage(), getMessageSize(), newMessage(), and nextBlock(). Definition at line 125 of file llsdmessagebuilder.h. Referenced by clearMessage(), getMessageName(), and newMessage().